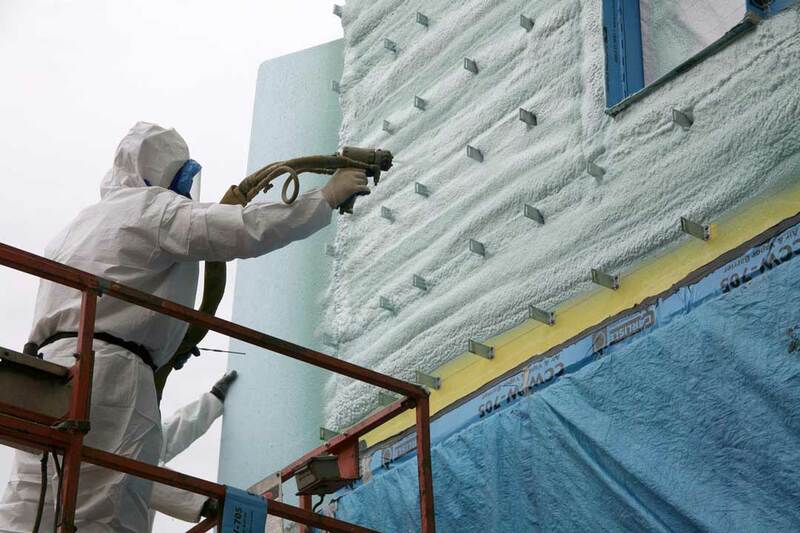 For decades, the U.S. design and construction industry has turned to sprayed polyurethane foam (SPF) to insulate and air seal buildings. SPF can help provide temperature control in various climates, reduce sounds transmitted through the air, and lower construction costs. When employed as a roofing material, SPF’s monolithic nature allows for a seamless, self-flashing application that can keep out water. It can also improve energy efficiency through its superior insulating and air barrier qualities, helping building owners and general contractors comply with energy codes and meet performance requirements for green building programs and certifications. As the use of SPF grows, the industry is working to provide answers so architects, engineers, and construction professionals can be confident when specifying SPF insulation or roofing to achieve energy-saving or sound-dampening. The molecular structure of the polyurethane cells in the foam produced determines whether SPF is classified as open- or closed-cell. Each type has certain characteristics determining the applications for which it is most appropriate. Also known as 1/2-pound SPF, which refers to the density of one cubic foot of the product, open-cell SPF is best suited for applications such as ceilings, interior walls, floors, and the underside of roof decks. As a low-density product, this type uses water as the blowing agent. When the foam forms, the water reacts with other chemicals to produce carbon dioxide (CO2), which expands the cells to form semi-rigid porous polymer foam. The CO2 leaves the cells and is replaced with air, hardening the foam. 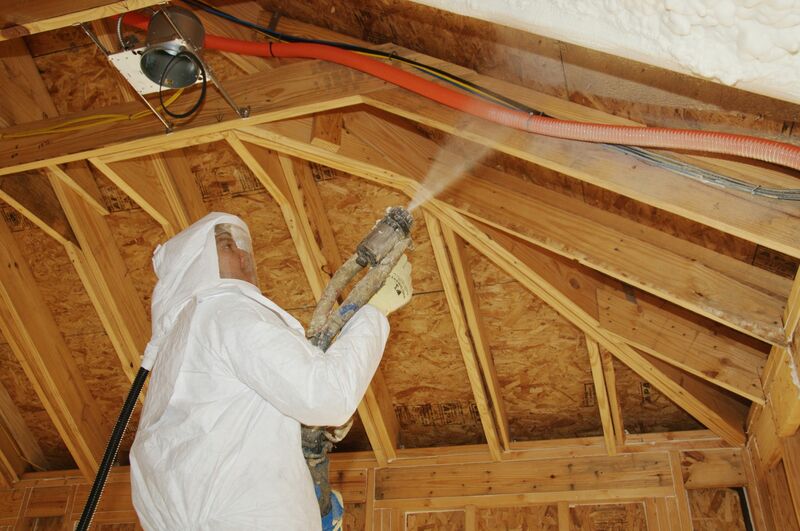 Spray polyurethane foam (SPF) is widely used to insulate buildings. the underside of roof decks. High-density foam is used primarily in flat or low-slope roofing applications, since its density and rigidity lends itself best to this purpose. One of the most important considerations for architects and builders is selecting a professional contractor to install SPF. Each manufacturer has its own model specification to help architects and specifiers choose the proper product. A contractor should be able to educate architects and builders about the product, its applications, and installation process, including any mechanical ventilation needs during the installation and afterwards. General contractors and specifiers should consider using an SPF company that employs individuals who have completed the Center for the Polyurethane Industry’s (CPI’s) SPF Chemical Health and Safety Training, and who have been certified by the Spray Polyurethane Foam Alliance’s (SPFA’s) new Professional Certification Program for SPF applicators. The comprehensive certification program, developed in compliance with American National Standards Institute/International Organization for Standardization (ANSI/ISO) 17024, Accreditation Program for Personnel Certification Bodies, focuses on safety, quality installation, and professionalism. SPF’s monolithic installation allows it to be used around irregular shapes and penetrations. 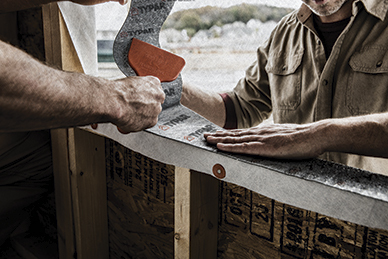 A reliable air barrier and a continuous seal are essential elements in creating an energy-efficient, comfortable space. Both types of SPF meet the requirements of an air barrier material at a typically installed thickness of 25 mm (1 in.). When installed with other materials in a building assembly, SPF can provide an effective continuous air barrier. 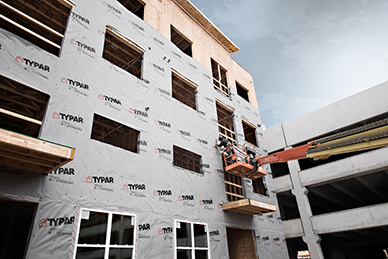 By acting as both insulation and an air barrier, it could even help lower construction costs, because less air sealing materials would be required to meet local and state building energy codes for air leakage mandates. Since SPF adheres to the substrate, it allows for easy monolithic installation around irregular shapes and penetrations. The material is applied as a liquid and then expands into foam in any nook and cranny in the enclosure to provide a seal. This offers energy performance and occupant comfort. 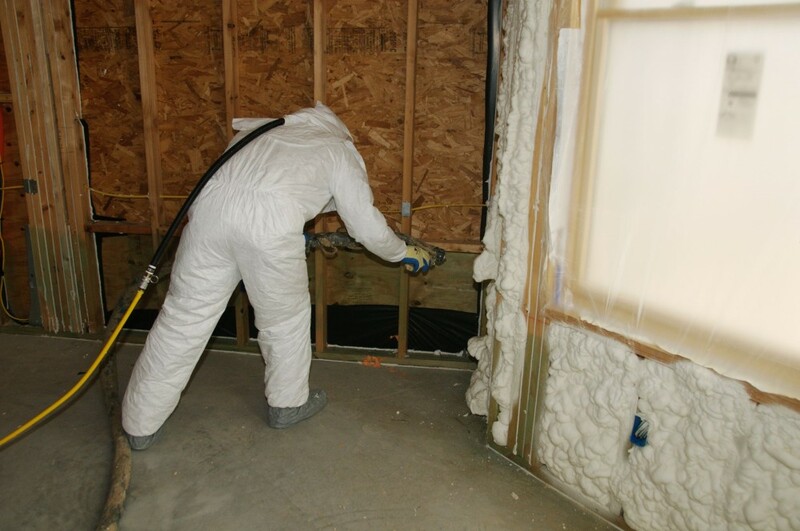 Open-cell SPF, typically associated with residential applications, is commonly used to fill cavities in interior spaces or to insulate unvented attics. This type is moisture vapor-permeable, and usually requires a properly designed and installed vapor retarder. Generally, open-cell foam has an R-value between R-3 and R-4 per 25 mm (1 in.) of thickness. Open-cell SPF has also been used on the underside of roof decks in multiple climate zones for years. 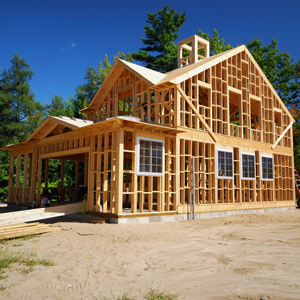 As with the usage of all building products, the building science of the structure needs to be understood. Potentially, a vapor barrier may be needed with open-cell SPF. Open-cell is vapor permeable, so depending on the structure, design, and climate zone, a determination of whether a vapor barrier needs to be added should be made. If a roof leaks when open-cell SPF is used on the underside of the roof deck, the water will likely gradually move its way through the open-cell SPF. Since it is an open-cellular matrix, the water, in a relatively short period of time if in sufficient quantity, will pass through the foam, and the leak can be identified and then repaired. Closed-cell is the dominant SPF material for commercial construction, especially when used as an air barrier and thermal insulation system applied on the building’s exterior, or as foundation and slab insulation. This type of SPF has a higher R-value than open-cell—typically between R-6 and R-7 per 25 mm of thickness. Its relatively low moisture permeability means it rarely requires an additional vapor retarder. An exception may apply in areas, such as bathrooms, with high relative humidity (RH). Regardless of the project type, understanding SPF and its influence on a building’s energy performance is critical. During the design process, architects and general contractors need to take these impacts into account so they can take advantage of SPF’s energy-saving properties. For example, buildings using SPF as the insulation of choice typically require the use of smaller HVAC systems because less air escapes the building, reducing the heating and cooling loads. 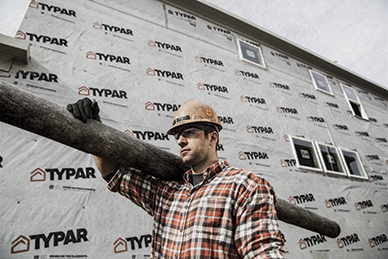 SPF insulation seals gaps to reduce air leaks. While SPF is most often associated with energy-saving properties, it has numerous other benefits, including soundproofing. 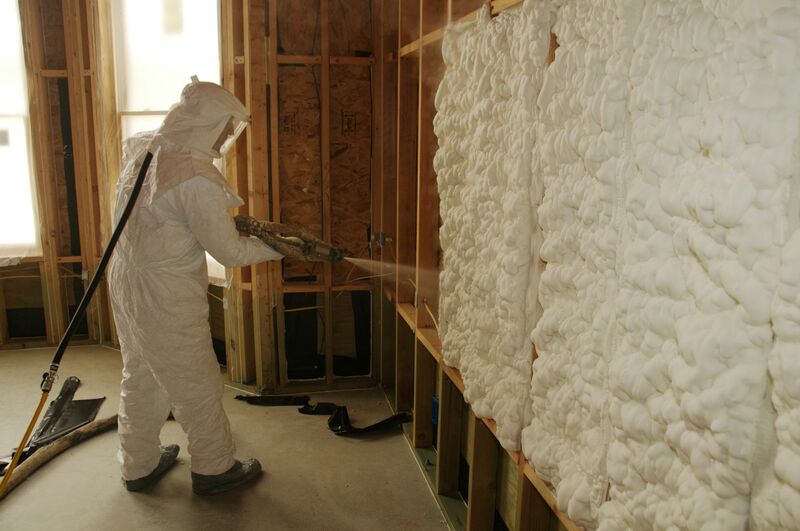 In commercial and residential buildings, open-cell foam is typically used in interior partitions for sound control. Since SPF seals the cracks and crevices in a building, and adds another layer between the interior and exterior, it helps dampen noises that travel through the air, such as the sound of an airplane overhead or a phone conversation in the adjoining office. Given SPF’s ability to air seal, it is necessary to design proper air distribution systems to control moisture and air flow within the finished building. While a continuous seal is desired, interior spaces require a certain amount of outside ventilation to maintain air quality. Similarly, moisture created by cooking and bathing must be able to dissipate safely within the building. Ultimately, all construction projects are judged on their integrity—how long they can withstand the tests of the elements and time. 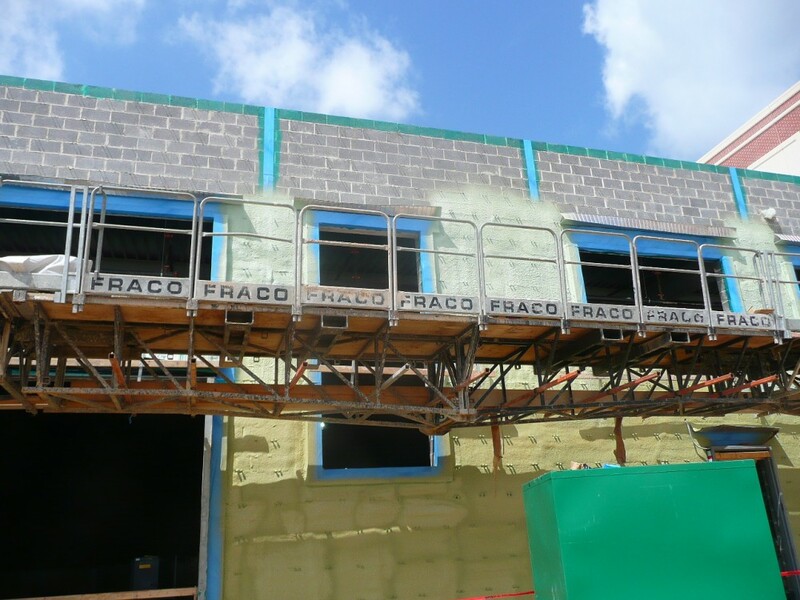 SPF, especially closed-cell foam, enhances a building’s strength and stability because of its rigid structure. 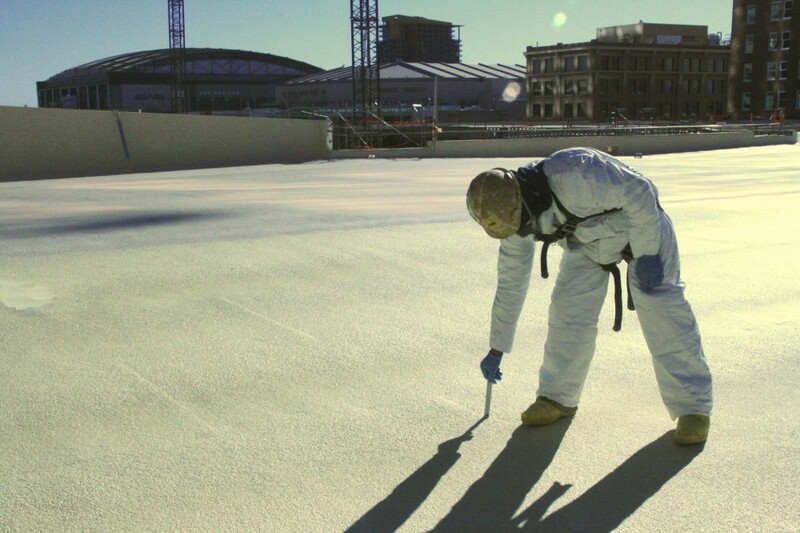 Many of the properties making SPF effective as a stabilizer also make it attractive for flat roofing applications. SPF roofing, a high-density closed-cell foam, can form a continuous insulation (ci) barrier on the top of a roof deck. Since SPF roofing has no seams or joints and is rigid, it forms an impermeable surface. Since it is fully adhered to the substrate, the rigid foam provides exceptional uplift resistance during severe storms producing high winds. About 10 months after Hurricane Katrina, the National Institute of Standards and Technology (NIST) issued, “Performance of Physical Structures in Hurricane Katrina and Hurricane Rita: A Reconnaissance Report”1 on damage to buildings in the Pascagoula, Mississippi area. It found all but one of the buildings with SPF roofs made it through the storm “extremely well without blow-off of the SPF or damage to flashings.” For the building that was the lone exception—just one percent of its roof area had failed. An SPF roof properly maintained with regular recoats of the exterior membrane can last for decades. According to SPFA, some SPF roofs have lasted for more than 30 years. Closed-cell SPF also enhances a structure’s resistance to water damage. By acting as a barrier to water and condensation in the building envelope, SPF can help a building resist the growth of mold and mildew. Its ability to adhere to and around surfaces ensures every nook and cranny is filled, so there are no spots for these to grow. Its water-proofing abilities extend to increased floodwater protection as well. Closed-cell SPF is a material that meets Federal Emergency Management Agency (FEMA) requirements for a Class 5 flood-resistant material—the highest class of materials that can resist damage from floods, according to a FEMA technical bulletin, “Flood Damage-resistant Materials Requirements for Buildings Located in Special Flood Hazard Areas in accordance with the National Flood Insurance Program.” This class of material can submerged for 72 hours, and can easily be dried and cleaned following a flood. SPF’s monolithic nature allows for a seamless, self-flashing roofing application to protect against moisture. With several types of SPF available and numerous application possibilities, it is worthwhile for architects, specifiers, and builders to gain a deeper understanding of this product. SPF allows for more creative design, filling in cavities and covering surfaces that could otherwise pose challenges. It helps reduce air infiltration, eliminating intrusions from dust and pollen and making buildings more comfortable. As a roofing material and exterior insulator, SPF can strengthen a structure by increasing its water resistance and durability. Peter Davis is chairman and CEO of Gaco Western, chairman of the Spray Foam Coalition at the Center for the Polyurethanes Industry, and serves on the executive committee of the Spray Polyurethane Foam Alliance (SPFA). He can be reached via e-mail at pdavis@gaco.com. Wow, spray foam helped prevent damage during hurricane Katrina? I guess it really is as effective as professionals make it out to be. I would prefer to read an article that was more critical and investigative, rather than a sales pitch for SPF. I appreciate the lens through which Mr.Davis has presented this wonder material. However, I would like to know more about the constructability concerns, or any red flags during the specifying or application process to avoid failures. I noticed another trade group, the Air Barrier Assoc. is not listed as a reference, I would only hire contr. certified/trained by Mr. Davis’ organization or the ABAA.